QuickBooks Online Reviews: Overview, Pricing and Features. QuickBooks Online is Intuit’s accounting solution for small businesses, startups, freelance bookkeepers, and independent accounting firms. Offering robust tools for expense tracking, tax calculation, invoice management, and sales monitoring, this best-in-class software is purpose-built to simplify small business accounting and financial management. With this at your disposal, you can cut down the time you spend on tedious accounting tasks and focus more on the attention-demanding responsibilities of your business. QuickBooks Online prides itself on being able to combine all of the essential accounting tools in a single platform. Be it profit and loss reporting, invoice customization, or bill payments, this software solution has it all. It can even perform real-time finance monitoring and generate reports based on your preferred data visualizations. This way, it is easier for you to get insights into your sales performance, expenditures, and other crucial financial data. To make things even better, QuickBooks Online was built for compatibility with both desktop and mobile devices, allowing you to access your data and manage your finances even while you’re out of the office. In addition to its wide range of functionalities, QuickBooks Online was also made to play well with both native and third-party integrations. This way, you no longer have to jump from one platform to another in order to perform your different business processes. One of the biggest perks that QuickBooks Online has to offer is that it is completely web-based. With this, all you need to do is access your account to view whatever data you need at the moment, and you’re good to go. You will no longer have to be inside your office, on your computer in order to get the information you need. In fact, you may even access your account using your smartphone, increasing the mobility of your operations. Making sure that your financial data is safe from unauthorized individuals shouldn’t be a difficult thing to do. With QuickBooks Online, you get access to intuitive security options so that they can effortlessly safeguard the confidential data that passes through your accounting system on a daily basis. You may even choose to back up your data to the cloud for record keeping, exporting them into spreadsheets only when necessary. Lastly, QuickBooks Online offers flexible subscription packages that will surely help you make the most out of your investment. Their plans are bundled according to the different accounting toolsets that you might need for your company. This way, you can be sure that you are only paying for the functionalities you need and not on bloatware. What’s more, all of their subscription packages are already inclusive of regular software updates to ensure that your platform is in tiptop shape at all times. Every enterprise has its own characteristics, and might require a special Accounting Software solution that will be adjusted to their business size, type of clients and staff and even specific niche they support. It's not wise to count on locating an ideal solution that is going to work for every business no matter what their background is. It may be a good idea to read a few QuickBooks Online reviews first and even then you should pay attention to what the software is supposed to do for your company and your employees. Do you need a simple and straightforward app with only basic features? Will you really use the advanced functionalities needed by pros and big enterprises? Are there any specific features that are especially useful for the industry you operate in? If you ask yourself these questions it will be much easier to find a reliable service that will fit your budget. We realize that when you make a decision to buy Accounting Software it’s important not only to see how experts evaluate it in their reviews, but also to find out if the real people and companies that buy it are actually satisfied with the product. That’s why we’ve created our behavior-based Customer Satisfaction Algorithm™ that gathers customer reviews, comments and QuickBooks Online reviews across a wide range of social media sites. The data is then presented in an easy to digest form showing how many people had positive and negative experience with QuickBooks Online. With that information at hand you should be equipped to make an informed buying decision that you won’t regret. 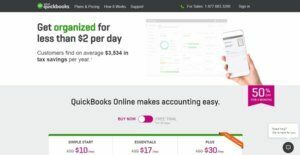 What are QuickBooks Online pricing details? Pros: I love the fact that it's relatively simple enough to dive in and know about it right away. That's its biggest selling point since the each customer can go in and peek into their financial details and be able to comprehend what's going on. The great thing with this is that it can restrict functionality to certain people to carry specific tasks. Cons: Expect some learning curve especially for those who have already used Quickbooks. When you finally figure out a way to make your way around, you'll realize what you can do and you can avoid. You can even set up things the way you want them to. Pros: I love its simplicity in terms of logging in, adding in a new client, and setting up an invoice and directly emailing it to them. It's super easy to add a customer through the fields provided. Everything is explained. I'm really good at being creative with things. But I have to admit, accounting or anything to do with finance is not one of them. Cons: I feel a bit overwhelemed whenever I log in. There are way too many places for me to look into and information that I need to access. I'm not a detail-oriented guy. So I feel it's better to have a simple layout while looking attractive at the same time. I'm an artistic person that appreciates anything that's appealing to the eye. I don't have the brains for anything but I'm able to utilize this. An accounting solution that's user-friendly and convenient to use. Accountants and bookkepers should definitely use this. Very easy to use and exlore the software. Intergrates easily with varous devices. Simple and accurate for all accounting tasks. This accounting software is so easy to use! Fantastic to have for accounting! If you need more information about QuickBooks Online or you simply have a question let us know what you need and we’ll forward your request directly to the vendor.